Also known as side impact collisions, “T-bone” accidents occur when one driver strikes the side of another individual’s car, resembling the letter “T.” These crashes can be particularly devastating as the sides of cars often fail to adequately protect passengers and the driver from injury. If you or someone you love has been involved in a T-bone accident and you sustained serious injuries as a result, contact an experienced attorney as soon as possible to learn more about your legal rights. The University of Michigan Health System reports that approximately 3.18 million side impact collisions occur each year in the U.S., accounting for 30 percent of all vehicular fatalities, or 9,400 deaths. These accidents usually occur when a driver makes an improper turn, fails to obey traffic signals such as stop signs or red lights, or fails to yield the right-of-way to another. In many side impact collisions, the driver most likely broke a safety law such as failing to yield to another driver or behaved in an unreasonably careless manner. Those who are speeding, aggressively driving, or driving while under the influence of drugs or alcohol are more likely to cause T-bone accidents. In the event of a T-bone collision, the impact of the striking vehicle may cause the side of the hit car to cave inward and, depending on the force of the striking vehicle, may cause parts of the car to intrude upon the space inside the hit car. As a result, these incidents can cause serious harm or result in the death of a passenger or driver who is crushed in the incident. Although some vehicles are equipped with rear airbags, the sides of the hit car typically have little material to absorb the force of the impact. Not only are occupants endangered by the crushing pressure of the door, but also the side of the car simply cannot absorb all of the energy from the collision. 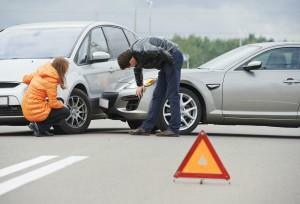 If you have been injured, it is important to seek legal counsel as soon as possible to learn more about your rights. You may be entitled to pursue a claim against the liable party and recover damages for medical expenses, pain and suffering, lost wages and wrongful death if you are filing on behalf of a loved one. An experienced attorney such as Van Sant Law can review your case, help to gather the evidence necessary to prove your claim, and work to help you seek the compensation to which you may be entitled. Call Van Sant Law today – (404) 991-5950, or fill out our free, no obligation online contact form to learn about your legal rights.